Hogan’s Interactive collection is one of the bestselling and popular lines that the Italian luxury label has to offer for women who know want they want from their urban casual shoes. This season’s 2013 Spring and Summer Interactivecollection has a number of interesting models to choose from, and all with the famous H logo that characterizes the brand, which is part of the Tod's empire. 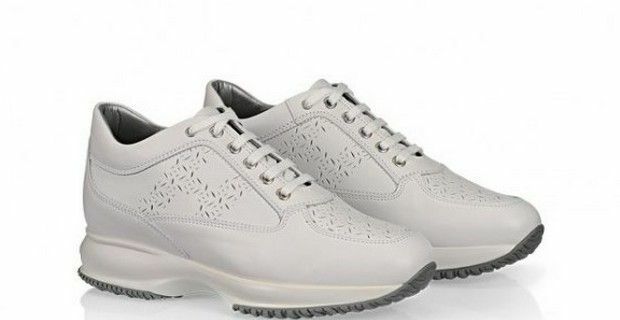 Sneakers are comfortable, but Hogan’s Interactive sneaker line is not only lightweight, they are casual and chic, and combine style and personality, and are must have shoe that any woman needs to add to her shoe closet. The iconic Hogan Interactive are available in leather, nabuk and suede and in a wide range of colors, from the classic white to black, neutral nuances, like sand, beige, but also in two metallic colors or blue and eye-catching fuchsia. The classic model featured in the above photo is in leather and features perforated panels and the Hogan monogram on the side is in an arabesque pattern. There are other models available in suede with satin panels and diamanté encrusted side logo that adds a glam touch or sneakers that combine suede and leather with high-tech fabricand panels in lurex. For a more decisive style, why not check out the models decorated with studs which are a continuing trend this season and also the next, but there are also the sneakers that feature soft matelesse leather work. If you find these Spring and Summer Interactives are a little too staid and serious, and want something more young looking, we suggest you check out the Katie Grand loves Hogan collection. After collections in collaboration with fashion designer guru Karl Lagerfeld, Katie Grand, editor-in-chief of Love Magazine has also designed a line for Hogan, reworking classic models from the Attractive, H194, Olympia and the Interactive models. These models display bold and vibrant colors and also heart applications - that reference Grand’s bi-annual magazine, Love.